Ultralight Backpackin’ Tips by Mike Clelland! 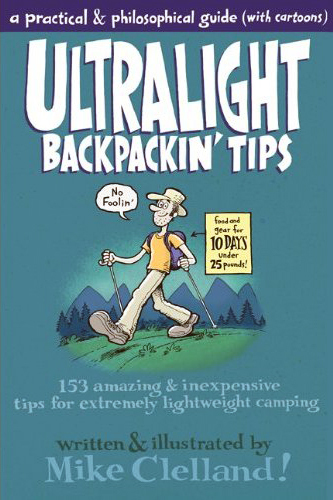 I just finished reading this new book called “Ultralight Backpackin’ Tips” by Mike Clelland! and I really enjoyed it. My eye was caught immediately by the cover’s claim of “food and gear for 10 days under 25 lbs.” and it really does explain how this can be achieved. I tend to over-pack my pack (a LOT) and this really opened by eyes and helped me think in a completely different way about backpacking in the wilderness. Again, I used to pack everything that I thought I could possibly need while out camping. Whether it was my ax or my 3 knives or my multiple fire starters, I can honestly say that I was prepared for anything. Then I read the book and thought: “If I’m as skilled as I think I am, I can get rid of a lot of this dead weight that I never really use…” So I made of list of things I felt were absolutely necessary and truly needed and compared that to what I had in my pack and I was able to cut my pack weight by 75%!!! I can carry a smaller pack, feel less strain on my back and knees, and go farther each day than I could before. While I’m not quite as light as what the book presents, my pack is already so much lighter and more enjoyable to carry. I have more confidence in myself as well knowing I can survive on less by taking gear that can be used in multiple ways. The book can get a little “preachy” at some points, but overall it’s presented in a very enjoyable and thought-provoking way. There is a line that can be crossed where you start sacrificing comfort and convenience for a lighter pack, but the book leaves that up to you. I’m not at 25 lbs. yet, and I’m definitely not leaving behind my Jetboil stove for a home-made alcohol burner, but this is a start. A definite must-read!